This year I helped make a decision that caused a considerable amount of strife among the DoveLewis technician staff and even anger and disappointment for a few of my most senior technicians. No one likes to deal with conflict so while you might assume that means I regret that decision, I don’t. It is part of my job as a leader to look at the possible outcome of any decision and make the best decision for DoveLewis. Not the best decision for me, or people I like, but the best decision for DoveLewis. That’s what makes being a leader hard. Here’s what happened. I helped decide and supported the decision to hire not just CVTs onto our nursing staff, but also to hire experienced Veterinary Assistants. If you have read any of our past blogs about the Technician Licensing Debate you can understand that this was a major shift in our hiring philosophy. And one that brought about many emotional conversations. Those conversations sometimes included tears. They also included long discussions about ideals, ethics, and debates about whether some people wanted to continue their employment with DoveLewis. Those conversations left some people feeling undervalued and not supported. Those conversations sucked. It was a hard process over the last year to get to this point, but, again, I don’t regret it. Over the last two years, DoveLewis’ CVT staff has been chronically understaffed. Part of it was some natural turnover that we expected when the recession thawed and part of it was the tremendous growth we experienced over the last several years. We went from seeing a little over 13,000 patients in 2014 to almost 16,000 this year. We added to our staff over the last few years, but handling and adjusting for that increase has been difficult. On top of this we are experiencing one of the tightest labor markets seen in decades. The national unemployment vacancy rate, currently trending at 5%, is almost down to where it was in 2006. For managers, this means we are in a Game of Thrones type feud for top talent. You see the signs everywhere (literally – help wanted signs are hanging in every window around Portland and in a lot of major cities throughout the country). And we aren’t even talking about CVTs. CVTs are in a whole other situation. There are just not enough of them to go around. Literally. The shortage for credentialed and licensed techs is widespread and while some states have not been affected, most have been. The BIG issue – the industry is simply not retaining technicians. Their career span is a short 5 years. We lose them to other careers, commonly they go to human healthcare nursing where they can make significantly more. The other issue that comes up often is a lack of respect for the technician profession. Many technicians are not given the autonomy to do the job they want to do – nursing. Finally, like all those in the healthcare fields, compassion fatigue takes its toll on many and for a technician; a career change is often a viable solution to burn out. Here in the Portland metropolitan area we have approximately 660 CVTs to work at approximately 450 clinics. That is about 1.5 CVTs per clinic and some clinics, like DoveLewis, have 25 to 30 CVTs on staff. Obviously, there is a math problem here. DoveLewis for years has recruited nationally. This has been a good strategy for us until about two years ago when we had two major changes happen. The first was that the Oregon Veterinary Medical Examining Board (OVMEB) updated their regulations which resulted in out of state applicants having an extremely difficult time getting their licenses recognized in Oregon. As you can imagine that has proved challenging for DoveLewis that helps pay for a technician to move across the country only to learn their CVT application is denied. The second issue is that we had what is called the “Portlandia Effect.” Portland, OR has become a very popular place to relocate to. For us, this has caused our once affordable city to become one of the most expensive places to live. This has had a financial strain on our staff and has made it difficult for candidates to relocate to Portland. It has had a strain on DoveLewis as well. Just this year we spent $100,000 on market adjustments to compensation to help our staff with the rising costs of the city. We will spend another $100,000 next year. So about 8 months ago, I began to try to find new solutions to our problem. Along with my technician management I looked at a number of different solutions, but none that would solve the simple math problem we were facing – there are not enough CVTs to fill our openings. About a month ago we surveyed the technician staff to just get a pulse on where they were on things. Hands down the number one issue listed was they were understaffed. This caused them to be exhausted, feel overwhelmed, and have a low morale. When asked about the issue of hiring Veterinary Assistants they were split. 65% for, 35% against. That 35% includes some of more passionate, top performing CVTs. Here is where the hard part of leadership comes in. Ron Morgan (DoveLewis’ CEO), Dr. Lee Herold (DoveLewis’ Chief Medical Officer), and I had to sit down and decide what was best for DoveLewis. What was best for our patients. And what was best for our entire staff. And that’s how we came to the decision that we did. As I stated earlier, DoveLewis’s technician staff is split on this decision. 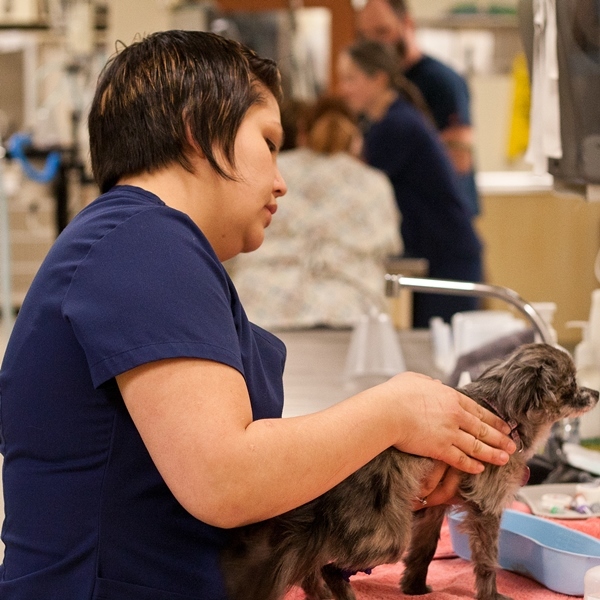 Some feel that this decision does not help move the technician profession forward whereas others feel that highly skilled Veterinary Assistants can enhance the staff and help us from being understaffed. At the end of the day, from an ideological standpoint I agree with wanting to promote the CVT profession. That being said, advocacy in that regard needs to happen at both the state and national level. DoveLewis is not the place for this advocacy, though I will support my staff members who want to work with their state associations on changes in this area. There are a great number of smart, highly skilled CVTs out there. There are also a great number of smart, highly skilled Veterinary Assistants out there. We want to be open to hiring them both. We HAVE to be open to hiring both in the current recruiting climate we are in. My staff’s sanity depends on it. And I have to understand that means I might lose a few people in the process. Again, that’s what makes leadership so hard. Best of luck to your amazing hospital. It's because of hospitals hiring veterinary assistants in place of RVT's in California that I'm in the process of leaving the profession. I have 23 years of education and experience, I'm published and have served on several board's of directors including my own state's RVT board. This was obviously a very difficult decision after all the effort I have spent on my career and passion. I'm beyond thinking badly about a decision such as yours, it's simply reality in these times. I believe this is a wise decision. Licensed technicians are a goal of our team also, but we will hire an experienced assistant just as fast if they have the skills and attitude we are looking for. Over the course of the last 6 six I have worked with some assistants that have been trained up and can hold their own with some of our licensed. They don't always have as much head knowledge but their hands on skills are amazing and their willingness to learn has been impressive. I am a CVT, VTS (ECC) in Parker, CO (near Denver). We are certainly feeling the shortage here. We too have been chronically short-staffed for 2+ years and constantly have adds for hire on many websites (including international ones). We are currently having this discussion in my hospital. I have a few questions that my help us decide what to do. In what capacity are you using the veterinary assistance? Would a highly skilled assistant take the place of a technician? Have you seen any turn-over from seasoned staff because of your decision? Are you starting highly skilled assistants off at the same rate as technicians? Have you started any programs to encourage certification or incentive to keep certification? Thanks for your time. Hi Stephanie! We are using Veterinary Assistants to do nursing care with the only exception being what they cannot do by law. A highly skilled, experienced VA that passes our interviews (including a medical interview and working interview) would have a full-fledged role on the nursing care team. We debated this a lot, but at the end of the day our Chief Medical Officer felt it was inefficient to have a staff member who was limited as she did not feel that would help our staffing problem in whole. We have not had turnover of seasoned staff since making the announcement (but our short staffed schedule caused turnover). Veterinary Assistants make less. We definitely encourage certification, but in Oregon there is no way to get your CVT without going to school - which can be difficult with a full time job. We will continue to work on incentives for both CVTs and VTS. Please let me know what other questions you have! So far all of our new hires have still been CVTs but we are open to those awesome, highly skilled Veterinary Assistants. I am currently a full-time VA working in SE Portland entering my 2nd year of school in an online CVT program. I am so split on this issue because I know it would help our profession advance but I was hired with no experience and I know how far I have come. I believe Dove made the right choice here. Our clinic is understaffed and it is hard on the techs, doctors and patients. Some institutions (Banfield) try not to hire CVTs because they cost more and this leads to doctors doing tech work and the staff not being utilized to their full potential. Education and certifications should be a priority. Experience gets you the "how" and education gets you the "why". Is Dove going to start sponsoring education for their veterinary assistants if they wish to go to school online? Good question. As you know, the cost of living in Portland is rising so rapidly and because of this our priority for staff is increasing wages. That being said, contributing to education is absolutely something we would consider, but we (just like everyone else) have to prioritize where our money is spent and our priority is wages for now. What a hard decision to make! 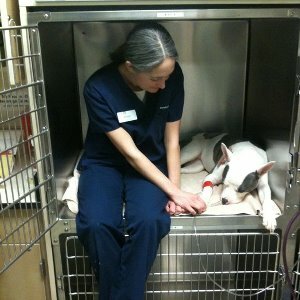 I can't imagine what I would do without all of my wonderful Veterinary Assistants if my clinic only hired RVTs. It is such a complex issue with so many contributing factors..... I support formal education and credentialing but we would be nowhere without my vet assistants. We do what we can to set apart the RVTs in ways (financially, etc.) to help them feel valued and respected, but it isn't always enough. I believe we will have to continue inching along in our path to legitimacy as a profession for many, many years to come and we need all the varying perspectives to balance out the progress so we don't jump ahead too fast a create progress we can't sustain. 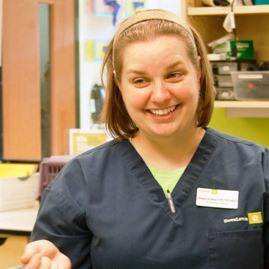 This article is such a great insight into veterinary hospital management and dynamics. If only we could live in such a perfect world where RVT's/LVT's/CVT's. were the entire staff. I have more Vet Assistants working, than Licensed Technicians.Granted in my city having more than 2 Licensed Technicians in a practice is HUGE. There has been a shortage here for about 5 years. Luckily, our state boards have granted, what is called a Vet Tech In Training License, which is a temporary license issued to Veterinary Technician Students currently enrolled in their 2nd year of an AVMA approved program or a recent graduate awaiting to take their VTNE's. This has helped us in enormous ways, not only when it comes to having a few more helping hands; but also it helps the students really get a grasp on what its like to be Licensed/Credentialed. My Veterinary Assistants are a huge help to our practice and I encourage them 100% of the time to go back to school/finish school. We always work with school schedules and we are always available to help with any studying or questions that they may have. That is the best solution that I have been able to use these past few years. The Tech in training License is an amazingly progressive idea! I will definitely pass it along to our techs that are involved in the state board. And I also appreciate how accommodating you are to school schedules. We have always strive to be as accommodating as we can, but it can definitely be a challenge. 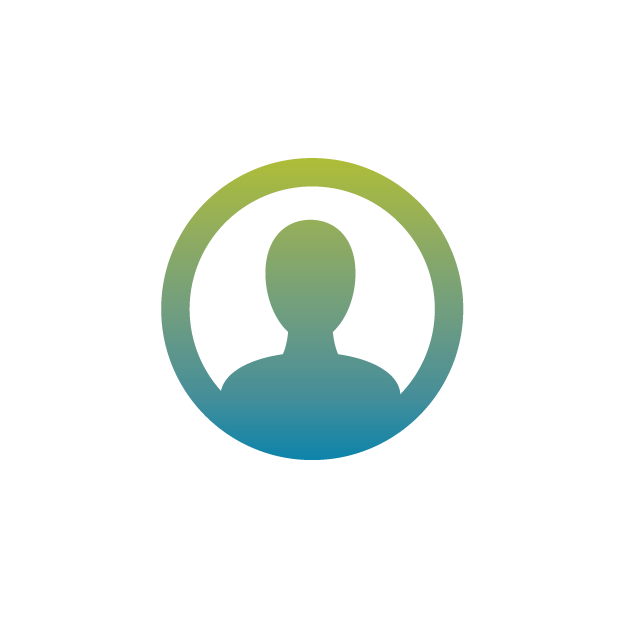 I'm a CVT VTS (ECC) whoI works with Stephanie in Parker, CO. When you hire people that are not certified do you intend to call them veterinary assistants even if they are using the same skills set as technicians? How do you differentiate between true assistants (those who are not responsible for patient care but do assist the technicians and veterinarians) and assistants that are responsible for patient care? Do they have a different job title? Also, how do you plan on avoiding devaluing the CVT? How do you reassure your CVT's that you support them despite the fact you are bringing in non-certified people to do their jobs? How do you prevent them from feeling threatened? Other than money/incentives how do you show your CVT's you still respect their professions and make sure they maintain their certification? The Oregon Practice Act calls non-credentialed employees handling nursing care Veterinary Assistants, so we took their lead on this. The technician title in Oregon is specific to CVTs. For our technician and doctor assistants, they have different titles, job descriptions, and even are on a different team with a different manager and wear different color scrubs. We have not had any confusion about who does what with these teams, but we are very structured role wise. As for devaluing the CVT, this is a wholly more complex issue. Do you tout the CVT as altogether more valuable and better than a veterinary assistant? If you do this, does that create a culture in which the veterinary assistants are second class citizens? Our leadership team would say yes - it would create that culture. We want to work to make all of our employees feel valuable. I look at this issue as I would any other profession in which there are some employees who went to school and some who did not. Equally, there are professions (like mine) in which certifications are earned but not everyone has them. The differences between those employees should be based on wages and incentives, but the value of the work product should be judged equally. Am I a better than other HR professional because I have a college degree and three certifications? No. I think I am a good HR professional because of my experience, approach, and background - including education. Are there better HR professionals than me who have no degree and no certifications? For sure. We are not making the decision to use VAs as a cost cutting measure. We are not replacing CVTs with Veterinary Assistants. We are simply increasing our candidate pool by being open to hiring Veterinary Assistants. So far no one has expressed they feel threatened as there are more jobs than people. That being said, it is definitely something to keep an eye on and communicate about, but because we are not using it as a replacement tool I would not expect this reaction. As for keeping credentials, we pay for CE, license renewal, and have extra incentives for VTS. I cannot imagine our staff not maintaining their CVT - there is no logical reason they would do that. They are proud of the work they put in to get their CVT (as are we). Of course, it also makes them more marketable long term. Hope that answers your questions, but please feel free to reach out if it does not. I'm starting feel more and more ashamed of being an assistant as time goes on. Reading up on points like this only makes me more determined to get back into school. I guess my hesitation to get back into school is the cost. I really really love my job. Being involved in the urgent medical care of someones beloved dog or cat is makes me so proud. And I'm fearful that one day if I don't get RVT behind my name, I will lose doing what I love. Please don't think that assistants are not well educated and we are willing to learn anything and everything to get the work done right. Maybe some are not certified or registered because of the cost of school or family obligations like children. But that said, any thing is possible including finding a way to back back to school and better your knowledge and skills. I agree. I didn't realize prior to reading these messages that there was so much widespread ire for veterinary assistants from registered technicians. It is difficult for me, as I would love to be registered, but unfortunately in North Carolina going to school online is not recognized and there are a lack of VT programs (three in the state, all conveniently located 2+ hours from me). That is not to say that I am making excuses, but like you said, it is difficult to balance working enough to pay my bills (I don't have a financial support system to do so for me) and maintaining the level of performance I would desire in school. If only online schools were accepted..
As a member of the veterinary community for over ten years I am as well, a bit disheartened by this debate. I started my veterinary career as receptionist in NYS on Long Island, I worked my way up over the years from VA to what I thought a technician should be, being head of my household and caring for my family has made getting through school rather challenging how ever my employers in NYS have never made me feel any less. Iin fact I helped open a brand new hospital shortly after hurricane sandy in Rockaway Beach NY as their Head technician, I trained a full staff and learned a lot as far as hospital management and OSHA were concerned, I have performed several procedures that would be deemed, as I now see, "not to be done by an Asst. or un licensed Tech" . I have done full dentals including difficult extractions, feline neuters and so on... I shortly after became the sole EOV TECH for a prominent company who for their safety shall remain nameless, I ran the ER ICU and ISO units as well as their Exotics ward and have saved many lives along side the EOV Doctors ( sometimes before they even got down stairs ;) .. ) How can I accept the title of Asst. or more over If I do, why be ashamed? My talent as well as the talent of many others in my position speaks for itself, in fact I have seen graduates of tech programs as well as some licensed techs, fall far short of what many VA's can do. Stand tall and be proud your skills will absolutely speak volumes as well as your character, the person you are will be felt not only by your co workers but by your patients as well, I cannot recount how many times I have heard " Oh... I thought you WERE the Doctor.... You certainly should be..." and to be honest I think about it, at 32 years of age I may consider returning to student life as I have a supportive souse who is willing to return to the workforce so that I may attend school. For now I will settle for returning to tech school to so called "earn" my LVT , although I and my patients as well as clients can say I certainly already have..
CHIN UP LADIES AND GENTS ! I feel your pain, I really do but if the positions you required were previously for a CVT how can they now be filled by an assistant? If a human hospital required more RN positions would they fill them with orderlies/assistants? Until we put our foot down as a profession and demand job protection we cannot as a profession survive. There is most assuredly a place in the healthcare team for talented assistants but in my opinion it is not as a replacement for a CVT. Granted I don't know Oregon law very well but here in GA an assistant can basically do everything an RVT can except non emergency intubation. Which means if a practice hires an assistant they don't have to hire an RVT. I see DoveLewis as a wonderful institution that should be at the forefront of all medical advancements. One of these advancements has to be RVT job security which this I am afraid will undermine that. licensed. In the meantime they are growing and learning hands on. We definitely need more licensed techs, but we too want all of our staff to go home at the end of the day knowing they did their best, they had the help they needed and want to continue to thrive in this crazy busy field we work in. And most important, be happy. I like that you show compassion for your staffs sanity, it shows you care. I am definitely for hiring both,. The assistants and RVT's I have hired, I feel compliment each other. And they would tell you I say that at every meeting because it's true. Always looking to improve and that's why it's called teamwork.